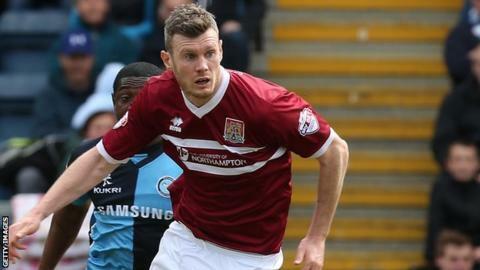 Northampton Town will sign defender Zander Diamond on a three-year deal after he is released by Burton in June. The 28-year-old joined the Cobblers on loan in February and played 14 times to help the club survive relegation from League Two on the final day. Out-of-contract trio Joe Widdowson, Gary Deegan and Leon McSweeney will be released this summer. JJ Hooper, Alan Connell, Claudio Dias, Matthew Harriott and Ben McNamara have also not been offered new deals. Former Aberdeen centre-half Diamond told BBC Radio Northampton: "The decision was made before the season was finished. "The gaffer has shown faith in me by bringing me in on a long-term deal and hopefully the form we ended on, we can kick that on in the beginning of next season. It was such an easy decision to make." Defender Mathias Kouo-Doumbe is currently out of the country and will discuss a new contract when he returns. Fellow defender Widdowson, 25, played 28 times this season, while midfielders Deegan, 26, and McSweeney, 31, made 30 and 18 appearances respectively. Boss Chris Wilder, appointed to take over the Cobblers in January, has offered contracts to David Moyo, Chris Hackett, Gregor Robertson and youngster Connor Roberts, while long-term injury casualty Alex Nicholls will be invited to join training in pre-season. On his summer recruitment, Wilder said: "We're looking for a right-back, a left-back, possibly a utility midfield player, a wide left player, maybe a winger that can do both sides and two forwards - so we're looking to bring seven players in."